1,000 memories made up you and me. How the books around you, piled. How you liked Rock and Roll the most. Turning from one into an infinity. How you were so tall, and I was so small. How in a debate about skim milk, you would never yield. Turning from one, to this entire life of mine. If I tickled you, you’d give up the remote. And changed color with every emotion. Breaking one by one against the sand. We slipped–beautiful crystals through our hands. A final hug, tears in our eyes. How do you forget 1,000 things? How do you let go of 1,000 dreams? Jobs, friends, lovers, wedding rings. 1,000 waves, you and me. On average, according to all those studies the universities put on, women talk an average of 20,000 words a day…and men roughly 7,000. Before getting into this post I just have to say it: is it possible that us girls say 13,000 more words than guys a day?!?! (I’m kinda shy though…so maybe this is why this number gap is hard for me to fathom.) My basic point of these statistics is to simply point out: we talk an awfully lot. As I was thinking about where the rubber meets the road kind of moments, I kept thinking about all of the hopes, dreams, ambitions I’ve shared with people. I’m gonna get my master’s degree…I’m gonna write a book…I’m gonna travel hear or there…etc. But it’s not just the big dreams or plans…it’s the little ones too: I’m gonna try a new look, I’m gonna loose weight, I’m gonna help out some good cause, I’m gonna call so-and-so because I haven’t talked to them in forever, I’m gonna fix up the mustang, I’m gonna talk to the cute guy that sits across from me on the subway, I’m gonna start running every morning…IT COULD BE ANYTHING. Anything you think you could, should, or might just want to try doing. But realistically, how many of us actually get around to doing these things? How many of us just end up talking about doing them instead? Where the rubber meets the road. The moment of truth. NEVERUNDERESTIMATE the power of action. At the end of the day, Words are just words…all 13,000-20,000 of them. Action is what turns words into reality. Actions will get you where you want to be. Actions will make you a better person. Actions will help you find the right person. Actions will help you write your book. Actions will help you get into a new career. Actions will help you get healthy. Actions are what dreams are made of. Actions will make your dreams come true. Don’t just talk about what you are going to do. Do it. Let’s not be people with hopes and dreams and well…people who just end up with hopes that never happened or dreams that never came true. Let’s stop talking and get to work. Let’s put some action behind our words. Let’s accomplish things, let’s be someone who did something about their hopes and dreams….and all the little things. Whatever that thing is that you’ve been talking about doing…just DO IT (stealing from Nike, I know). There are a lot of us who feel or realize maybe our job isn’t anything special– we aren’t preforming surgeries on a day to day basis that save lives, we aren’t flying jets, manning businesses that literally make the world go round. We are the people that maybe sit in an office or flip burgers, cut trees–whatever our occupation is, it isn’t quite our dream job and it doesn’t really feel like it is that big a deal to the world. Her name was Bev, short for Beverly. She had been 25 for exactly 1 month. Twenty-five. A quarter of a century. Five years until thirty. Barely managing to cling onto being able to say, “I’m in my early twenties.” Bev was an average girl, with brown hair, blue eyes and freckles. Bev was also a girl who at one time believed she was going to be one of those people who change the world. Bev burst into tears, letting them spill freely down her cheeks. “You here it?” Bev’s Dad asked, his coppery colored eyes crinkling at the corners like they always did when he smiled. Six-year old Bev nodded, her brown curls swishing. “What is that, Daddy?” Her blue eyes where wide with curiosity. Her Dad touched the round, metal object pushing it along his chest. Bev’s eyes got bigger. “Boom-boom, boom-boom….Daddy what is it? !” She clutched the tubes of the stethoscope which were lodged into her ears, trying to figure out where exactly the boom-boom was coming from. Her Daddy smiled, eyes crinkling, dimples carving alongside the corners of his mouth. “That’s your Daddy’s heart beating,” he said softly. Bev’s mouth dropped open as she stared at her Dad in stunned silence. Bev had wanted to be a doctor. Since the day she heard her Dad’s new heart beat, since the day she discovered how her Dad’s life had been saved by a heart transplant, since the day she received her first stethoscope, since for as long as she could remember. Bev wanted to save lives. Bev wanted to give people the gift her family had been given. Bev wanted to make a difference in the world. And here she was sitting at a small office, her stethoscope buried in the back of her closet at home; buried under piles of bills, back luck, her Dad’s death, and the resentment and pain she felt from dropping out of medical school from grief. What would her Dad think of her? She was working somewhere where she saw more walls than she saw people. Where her boss called her the “voice-literally” of the company because her duty was to manage the phone lines and any other form of communication, yet no one saw or would see her face. She turned on her computer, and flung herself in the chair feeling hollow and missing her Dad more than ever. She pulled up her personal email account, breathing heavily. Her eyes fixed onto the last email from him. The last email her dad had sent before he died. She let out a deep breath and clicked onto it, reading over words she had nearly memorized by now. He had spent the last two years before he died traveling, volunteering with mission groups that brought food and medical supplies to children. He had been at a remote village in the Amazon Basin, his email filled with the story of his struggle to communicate with the locals in the village. “After hand motions…talking louder and louder and slower and slower (why we do we automatically do that? Hah! NEVER, EVER WORKS but we still give it a go anyway)…the whole nine yards–The chief smiled. And I smiled. He laughed. I laughed. 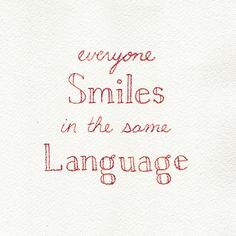 Smiling–it was just about the only thing we understood. I tell ya…if you wanna make a difference, make someone smile. Bev read the quote again and again. Could she ever really have an impact on someone’s life when her career involved practically zero human contact when it did not involve the phone or email? Bev logged out of her personal account and signed into the office email. As she was replying about a client’s question, she decided send out a smiley face next to her name. Before long, Bev decided to send out a smiley face with as much communication as possible, when appropriate. Whether it was through email or by her personal signature, she always sent out a little smile. She didn’t really think it would make a huge difference, but she felt like maybe she was at least sending a little happiness someone’s way. Apparently that smile mattered to some people a lot, a lot more than Bev realized. Today Bev is a cardiologist, making her dreams a reality, and signing her name with a smile. Wherever you are you can touch someone else’s life. If you can brighten someone else’s day or make them laugh or smile, or complement them in some way, you are a world changer. Even if it was just for a moment, you made someone feel like they mattered or that they were special. We need more of that in the world. Wherever you are…whoever you are…you can make a difference! 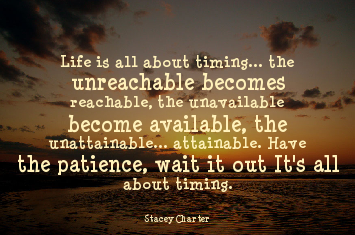 Never Underestimate the power of TIMING. Have you ever had something happen or a situation arise and at the current moment you could do absolutely nothing about it? But in literally a week you could’ve changed it, you could’ve done everything about it? And all you can think to yourself is NOOOOOOOOO–Timing why couldn’t you have waited?! When this happens we can sink into a horrible spiral where we question ourselves, “What if I had done this,” “What if I had done that?” “What can I do to change this?” Sometimes I think it is actually good to evaluate the situation, to ask these questions because maybe there is something you can do. But, in the occasion you come to the conclusion there is absolutely nothing you can do, take heart: sometimes even though it doesn’t seem like it, timing is actually on your side. Things happen for a reason, so DON’T LOSE HOPE. The person, job, or whatever life situation you find yourself in or apart of will work itself out if it is meant to be; if not, there is something so much better out there for you and it will find you at the right time. Much in life is underestimated. Whether it is people, places, or things…whatever it is…we often don’t realize the real value of so much in life until way later, way, way later or in some cases never at all. 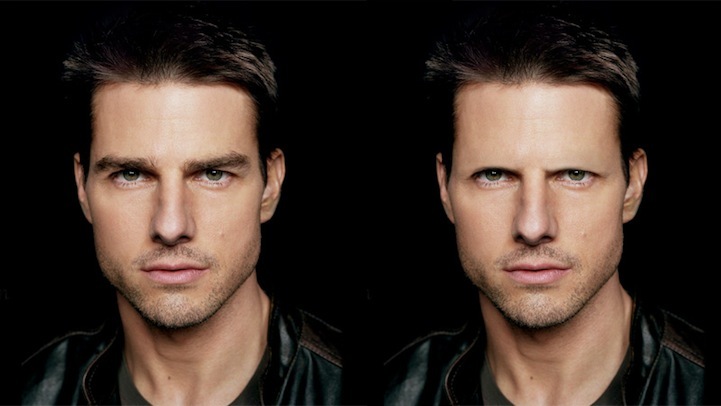 Eyebrows?! Are they really that big a deal? 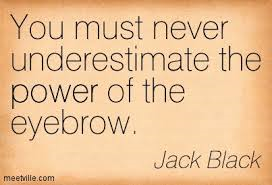 Don’t underestimate your eyebrows. Tame them. Trim them. Wax them. DON’T REMOVE THEM, please. (See above pictures). I have very…rebellious eyebrows. It has taken me YEARS to even attempt to tame the two beasts (who really, truthfully want to be ONE beast). Every now and then, they STILL rebel on me. So I know the struggle. I know the pain of tweezing, shaping, re-shaping, plucking, waxing…it all. (Except threading…haven’t tried that one yet!) But…it is worth the struggle. It is worth the pain. Not really sure how to end this so…good luck with your eyebrows and CHEERS! The Batman series is AMAZING. You know what makes this series so amazing? Alfred. 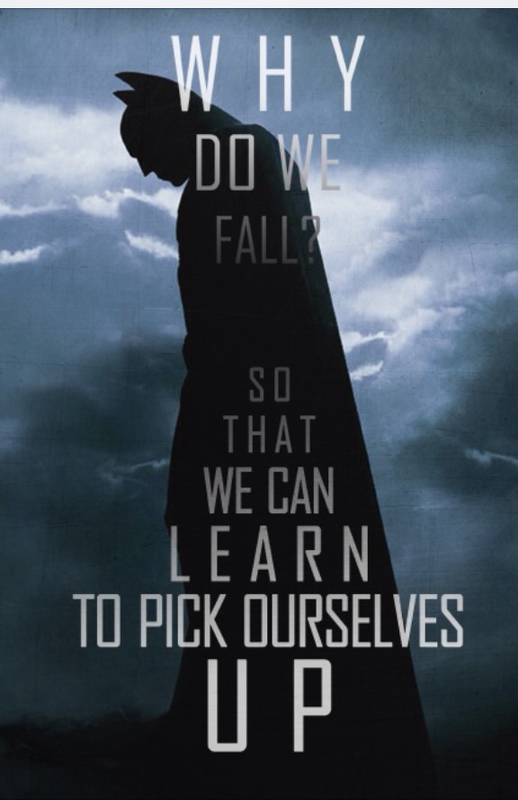 Alfred has always been one of my favorite characters…he’s just kind of awesome. Alfred is the butler, friend and unsung hero. Every hero…every person…needs an Alfred in their life-someone who will call us out, is fiercely loyal, inspires us or saves us from ourselves. We all are going to fall. Falling is painful. Sometimes things get broken on the way down. Sometimes they get so broken we don’t even think we can get back up. But no matter how bad the fall…GET UP. Don’t quit. GET UP. Don’t let the fall defeat you…use it to make you stronger. Falling hurts but it also teaches us, prepares us, motivates us, and makes us stronger. Every superhero has fallen, failed or experienced defeat….but we still call them heroes. Why? Because when they fell they got back up. Thank you Alfred for your words of wisdom! I am so excited to announce a series of blog posts I’m calling “NEVER Underestimate.” What does underestimate mean? It means not realizing or seeing the true value or importance of something. There are many things, people, places (? ), and practices which in our initial evaluation we underestimate. These posts will be short, fun, serious, meaningful, random and hopefully inspiring! That being said, I will be trying to be a more faithful blogger– things have been busy! I started a second job (I call my Euro-trip fund) working as a Barista (bright and early mornings…eessh! But making coffee and tea specialty drinks is awesome! ), and I have been editing, writing and rewriting my novel series. WHEW! It’s been crazy! Never underestimate the power of YOU, and what you can accomplish. It seems fitting way to start. We underestimate ourselves and what we can accomplish all the time. Some of the most amazing people in the world that I have such respect and admiration for are people who have disabilities and become athletes or achieve some other great accomplishment. These people are living, breathing proof that with hard work, a good attitude, and refusing to quit, we can accomplish things said to be impossible. Accomplishing anything great takes hard work…so the road ahead is going to be tuff, but YOU can do it. You can accomplish that thing that you were meant to do.